I have told myself that I would not write about Donald Trump, but the guy is the gift that keeps on giving, if by gifts one means a series of outrages that forebode some national or global calamity. 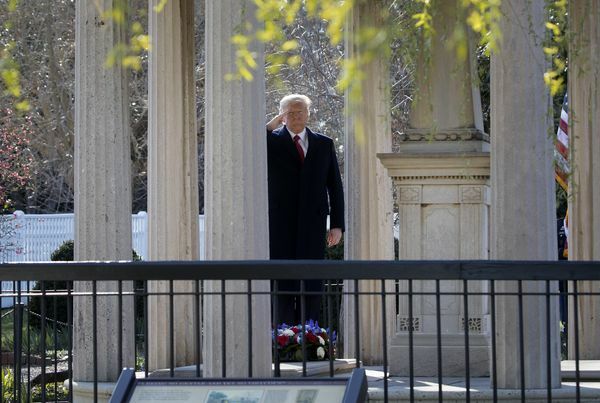 This week, on the Ides of March, our Bronze Creon visited the grave of Old Hickory, Andrew Jackson, the seventh president of the United States. Trump’s affection for Jackson is clear–a portrait of Jackson hangs in the Oval Office and, in a tweet, our current president thanked #POTUS7 for his service to the country. New Orleans? The slaughter of Creeks at Horseshoe Bend? Perhaps. Or was it Jackson’s distaste for the 1st Amendment in the form of his support for the congressional “Gag Rule,” or restricting abolitionist materials from the US Mail? Did Trump like Jackson’s desire to go medieval on the Nullifiers in South Carolina? Maybe it was because Trump embraced the myth that Jackson was an outsider, the people’s candidate, a kindred spirit of sorts, even if based on a flawed historical analogy. Or the ruinous Bank War? Or Jackson’s brutal embrace of majority rule whatever the consequences? For students of the Native American past, Andrew Jackson is identified with the policy of “Indian Removal.” (God, I hate that euphemism.) More than any of his predecessors, Jackson advocated removal as national policy toward native peoples. His supporters included many southerners and westerners who wanted Indian land. He called for removal in his first annual message. He signed the Indian Removal Bill into law in 1830. He argued that removal was not mandatory, but that native peoples who remained upon their lands must subject themselves to the laws of the states in which these lands were located. Those states offered no protection for the persons and property of native peoples. Earlier in his career, Jackson negotiated massive land cessions with southeastern Indian nations, and he appointed during his presidency the commissioners who used all means fair and foul to obtain signatures on removal treaties. During his presidency, thousands of native peoples left their homes in the east for new homes in the west. There is no doubt that thousands of native peoples died as a direct result of the policies pursued by Andrew Jackson. Our Bronze Creon told one interviewer that though he is very busy doing tremendous things to make America great again, he did find some time to begin reading a book about Andrew Jackson. I doubt that he learned much. The same day that Trump visited Jackson’s grave, a federal court in Hawaii struck down the president’s second attempt to ban Muslim immigrants from a handful of countries. Mike Huckabee, the Le Fou of GOP politics, said that like Jackson when confronted by a Court that challenged a fundamental assumption of his Indian policy, Trump should resist the judicial branch of the federal government. Huckabee became, in effect, the first person in the 21st century to see Jackson’s dismissal of the Court’s authority as admirable, and created the impression that this is a presidency run by men who have little knowledge of this nation’s past and less regard for the historic sufferings of its people of color. I have written about all of this before. Jackson is a bad guy. He ruled by anger. He shot people in duels. He menaced his enemies. He held grudges with such ferocity that he makes Nixon seem chill. He trashed the economy, and seems not to have understood banking. We should not shed a tear that he is slated for removal from the twenty-dollar bill. He is rightly associated with America’s long history of ethnic-cleansing. But here’s an unpopular point. Removing Jackson from our currency, or denouncing him as the author of a genocide against Native Americans, does not absolve any of us of the sins of our nation. Removal is a fact of life in Native American history. It began before Jackson took office, and continued long afterwards. (If you have not seen it, take a look at Claudio Saunt’s interactive map illustrating Native American land loss). I teach, for instance, at a college called Geneseo. I routinely drive through or visit places called Canandaigua or Irondequoit, and pass by on the highway places called Onondaga and Canajoharie and Nunda and Cohocton. The place names remain, after the people were removed, or consolidated on reservations in remote corners of New York state. A half dozen archaeological sites, all previously Seneca towns, are within a half-hour’s drive of where I sit. I walk along the old path of the Erie Canal, that symbol of New York’s rise as the Empire State that could not have been constructed without Iroquois dispossession. Both its original path and its current path pass by within a half mile of my house. In other words, look at the ground beneath your feet. It was once Native American land, and if you live in the east, like me, you likely have benefited from the relocations and removes that turned native peoples into refugees and exiles. A more astute politician, not to mention a more sensitive human being, might have acknowledged the costs of Jackson’s policies–policies that were popular at the time, and from which millions of non-Indian Americans continue to reap the benefits. A more historically aware President might have talked about the complexities of the past. But that is not Donald Trump’s style. He is not a deep thinker. 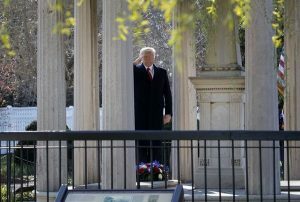 A man who recently congratulated the long-dead Frederick Douglass for the good work he is doing, Trump has shown no signs that he has any interest in or knowledge of America’s troubled past. And that is especially the case when it comes to the victims of American history.